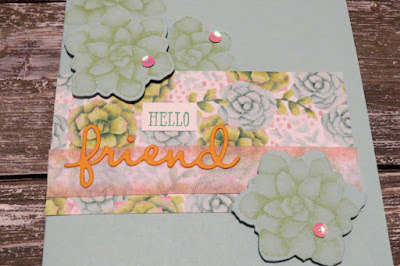 Karina's Kreations: Stampin'Up Painted Seasons Stamp Set Card! Stampin'Up Painted Seasons Stamp Set Card! Stampin'Up is releasing new Sale-a-bration items on Feb 15. One of the items is the Painted Seasons Stamp set and Painted Seasons Designer Series Paper. The coordinating framelit will be available to purchase on March 1. If you can't wait to get these new products get a starter kit number and you can purchase these products as part of your starter kit. You can choose $225.00 and pay only $135.00. It's an amazing deal. You also save 20% on all future purchases. This is one of the cards I made using the stamp set and paper. Isn't it gorgeous? I also used the Well Said stamp set and Well Written Framelits Dies on my card. These can be purchased in a bundle saving you 10% off. TIP: To add sequins to any card, place a tiny drop of liquid glue and use the new Take Your Pick Tool to pick up the sequin and place it on the glue. To purchase the supplies for this card, click on a picture below. It takes you to my online stamping store.